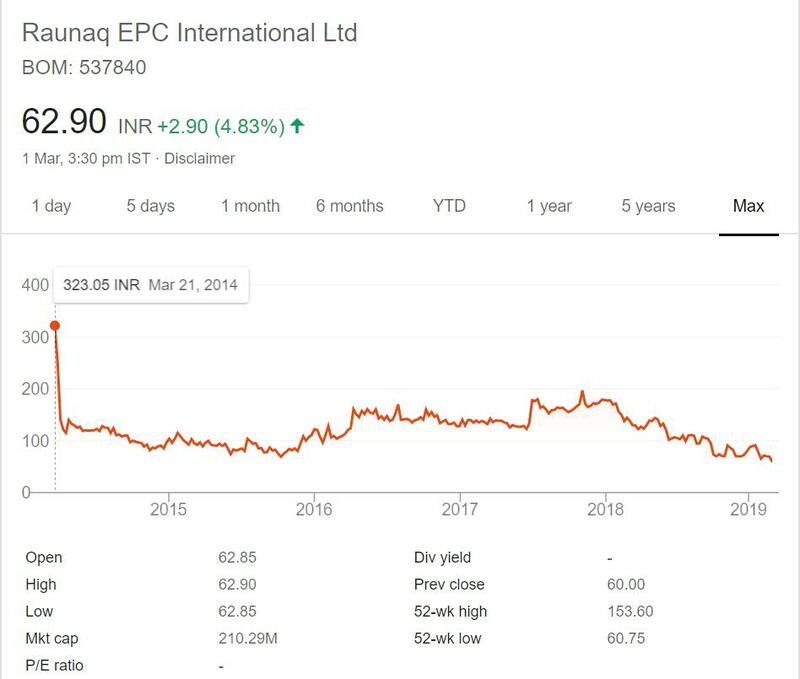 Raunaq EPC International Limited is in portfolio of Subramanian P. He is one of the top investors in India. The company belongs to Engineering sector. As per the Company website it is a group company of the Surinder P. Kanwar Group. The other major companies of this group are Bharat Gears and Clip Lok Simpak Pvt Limited and Xlerate Driveline India limited. It is engaged primarily in the service of core infrastructural and industrial sectors in India, namely Power, Chemical, Hydro-carbon, Metal and Automobile sectors. It undertakes the Turnkey Contracts of Mechanical, Civil and Associated Electrical & Instrumentation Works. The Company has some marquee names in Client list including Maruti Suzuki, Lanco, EIL and Nalco to name a few. It has registered office in Faridabad and other two offices in Mumbai and Kolkata. The stock is newly listed on Stock exchanges.It made debut in year 2014 at price of 323. It was good time to get listed as Market was in bull run mode. But that has not helped the stock. Right after the listing stock crashed and moved close to 100 levels.It traded between 100 and 200 range for next 4 years or so. IPO investors have lost good money in this counter. But the Company has so far maintained 100 mark for long and now is trading close to 60 mark. Raunaq EPC International limited is Engineering sector Company. It is business to business company. It provides services to different industries. You can view it as Engineering services Companies catering Power sector and other similar sectors like Auto. The growth of this Company is dependent on the sectors it caters. Since most of the industries or Clients it serves are in India so there is no cost advantage like IT industry. It has completed several projects for esteemed clients like Reliance. For example it completed piping project for Reliance and NTPC. The order pipeline is important for growth. Since this is new listing not much price action information is available. I am not very fond of Engineering sector as it is more of matured sector. The growth prospectus is limited because India does not focus on Manufacturing as of now. But you may see regained interest in this Company once manufacturing takes limelight in India. For now I am not invested in Engineering sector Company and will not advise you as well.